A really common question and concern from people looking at renting to own a Fort Lauderdale Florida house is “are you required to buy the house in a rent to own home contract ?” at the end of the rental term. Under that example, you have the opportunity to purchase the home for $200k within 24 months (often times you can purchase the home BEFORE the rental agreement ends with no problem). So, Are You Required To Buy The House In A Rent To Own Home Contract / Agreement? If the 24 months comes up and you’re just not ready to purchase the home… but you still love the home and want to live there still… just connect with the seller and see if they’re willing to offer you an extension on the rent to own contract. Often times, if you’ve been a great renter and show a genuine intent to buy the house… the seller will work with you (it’s in everyones best interest). If the 24 months comes up and you’re just not ready to buy and you don’t want to stay in the house… you can move out and not purchase the house… usually with no penalty. What Happens To The Money You’ve Paid The House Owner Up To This Point? If you choose not to buy the house, the time you spent in the home is treated just like a rental… since you didn’t exercise your option to purchase the home. 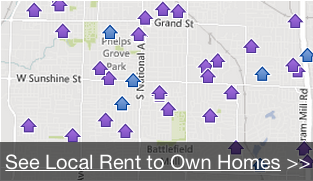 That’s the key distinction you need to be clear on with rent to own home programs. A Rental Agreement: First first part is a normal rental agreement. You pay a monthly rent on the house for a specified term. The Option To Purchase: This is a separate agreement that gives you the option to purchase the house for an agreed upon price at a future date. If you decide not to buy the home… you’re just deciding not to exercise your option to purchase the house… and everyone walks away looking at that past time as a rental. Really it gives you as the rental tenant / buyer great flexibility in the deal. If you want to buy the home… you can at a set agreed upon price. If you choose not to… no biggie! … check out our Fort Lauderdale Florida rent to own house program on this website and see our available rent to own / lease option homes by clicking the link below.